Agent 3 against an army of Octarians. The Octarians are a race of octopus creatures ruled by DJ Octavio, and the main antagonistic species of the story mode in Splatoon. They reside in Octo Valley and Octo Canyon, and are responsible for stealing Zapfish from Inkopolis. Their main ink color is purple/magenta. At one point the Octarians were a neutral species coexisting with Inklings, but this ended as result of conflicting interests of territory that lead to the beginning of the Great Turf War (in which the Octarians lost). Unlike Inklings, the species includes a great amount of sub-species that act differently from each other. Like Inklings, certain Octarians can switch between mollusk form and humanoid form at will. Octarians are an animal species which evolved from octopuses after the start of the Mollusc Era. Like Inklings, Octarians are ink-based creatures and are implied to not be able to live underwater, due to their historical fight with Inklings over the remaining land. Before that, they used to have a friendly relationship with the Inklings, but rising sea levels caused the two species to engage in a war called the Great Turf War. The war took place 100 years before the events of Splatoon, where the Inklings emerged victorious, which forced the Octarians to retreat and live in underground domes located in Octo Valley and Octo Canyon. While the length of the battle is unknown, it is revealed that it at least lasted over a year based on the date of a photo taken during the war. During the war, the Octarians used technology, such as the Great Octoweapons, which seemed to be more advanced than the Inklings who were depicted as using Bamboozlers. The Sunken Scrolls state that the Octarians were winning the war, but lost momentum due to the Great Octoweapons being turned off by being removed from of their plug. Another Sunken Scroll state that it was the Inklings' superior number of limbs that lead them to victory and the Octarians to a loss. It is unknown whether either of these statements could be propaganda by one or the other faction. The Inklings had a fighting force called the Squidbeak Splatoon which was by lead by Cap'n Cuttlefish. While the Squidbeak Splatoon ceased to be, Cap'n Cuttlefish continued looking after the Octarians after their defeat, where he has a cabin in Octo Valley and Octo Canyon as a lookout. The Octarian domes have been losing energy during the course of Splatoon, which may have caused some of them to no longer be habitable as suggested by the comic in The Art of Splatoon. DJ Octavio, who had been around for and partook in the Great Turf War, currently leads the Octarians and possibly planned to revenge against the Inklings and take the land back that they lost in the war . The Octarians have stolen the Great Zapfish, which helps power Inkopolis, and use it to power DJ Octavio's Great Octoweapon while using other Zapfish to power the rest of the facilities and bosses. Octarians have also been invading Inkopolis as evidenced by the missions that take place in Inkopolis during evening and nighttime, presumably while Inklings or other residents aren't around. To deal with this Cap'n Cuttlefish has started the New Squidbeak Splatoon, which consists of his granddaughters Callie and Marie as Agent 1 and 2, and recruits an additional member known as Agent 3 to rescue the Great Zapfish and stop DJ Octavio's plans. Agent 3 navigates through the Octo Valley domes and confronts DJ Octavio in a final battle. In this battle DJ Octavio uses the Octobot King which have turntables and speakers that play his music. After some time into the battle the Squid Sisters manage to hijack the music and play their song, Calamari Inkantation, which is a special song said to be coded into the very DNA of Inklings. While not visible in the game, several Octarians said to be spectating the battle, where this performance is said to have changed their lives. Even DJ Octavio is seen dancing to the song before he is defeated by Agent 3 and imprisoned in a snow globe. During the events leading up to Splatoon 2, the Octarians managed to brainwash Callie by equipping her with a pair of hypnoshades and free their leader, DJ Octavio. The Octarians have stolen the Great Zapfish again and rebuilt some of the Great Octoweapons as well as employing Octobosses now stationed in Octo Canyon. While Callie was brainwashed, it is implied that she helped decorating Octo Canyon after deeming it ugly. She can also be heard singing in the background music present at the Octo Canyon domes, where these vocals are reversed versions of her existing work. Cap'n Cuttlefish had gone on a research trip with Agent 3, so Marie takes the role to look over the Octarians while they are gone and recruits Agent 4 to help get the Great Zapfish back and rescue Callie. The final battle is staged like a concert, with multiple Octarians watching as an audience around an arena, where DJ Octavio is using the Octobot King II to fight Agent 4. DJ Octavio is seen playing on the turntables with his wasabi sticks, while Callie stands on the upper part of the machine and is singing and dancing. After they defeat DJ Octavio, he is again imprisoned in a snow globe, which is stationed in Tentakeel Outpost by the cabin. The events of Octo Expansion reveal that several Octarians, or at least Octolings, have had their "souls freed" by hearing Calamari Inkantation from the fight Agent 3 had against DJ Octavio. Many of these Octolings defected and found their way to Inkopolis, where they have integrated themselves to live among the Inklings. It is also shown that many Octarians have also been kidnapped and taken to another underground facility located under the sea, which belongs to Kamabo Corporation. These Octarians undergo several test with the premise that they will return to the surface if they succeed. These tests serve to select out the best genes, where the successful test subjects get tricked into building a machine that blends them alive into a paste of supreme DNA. 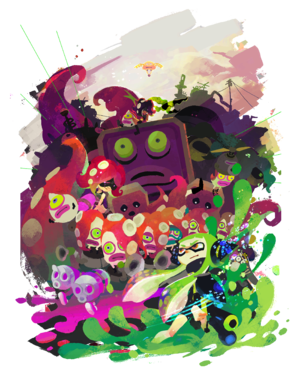 Other Octarians get Sanitized, which is a state reminiscent of zombie where they lose their sense of self and free will, and default to follow their command. They are also implied to be dead, as Marina states that they show no pulse or signs of life. Commander Tartar is responsible for this plot, who is an AI made by a professor to pass on humanity’s knowledge to the next intelligent lifeform. The AI changed its mind as it was disgusted by the senseless wars between Octarians and Inklings, despite their minor genetical differences, as well as their lifestyles. Agent 8 is one of the Octolings who ends up in the facility and loses their memories. They are revealed to be test subject no. 10,008 which suggests that there may have been 10,007 other test subjects in the facility. Given that only Octarians are Sanitized and Octarian technology is frequently used for the tests, it is possible that most test subjects were Octarian. This is further hinted by Commander Tartar's animosity towards specifically Inklings and Octarians, and that the denizens of the deep are explained to not necessarily be test subjects. Sanitized versions of the Octobosses that Agent 4 fought in Octo Canyon are also present in the testing facilites. Agent 8 is an Octoling who had their "soul freed" after listening to Calamari Inkantation. This song is also one of the first things they remember after losing their memory as well as motivating them to reach Inkopolis. They manage to escape the facility with the help of Off the Hook and help defend Inkopolis and the world from being destroyed. While being stuck underground in the facility, it's possible to read Agent 8's thoughts on the Octarians and their previous life in the army, as well as Marina's worry about being revealed to be an Octoling who also worked for the army. Cap'n Cuttlefish is apprehensive of the defected Octarians at first but shows support over the course of the Octo Expansion. The Inklings in Inkopolis are said to be unaware that Octolings are Octarians, and instead assume that they are Inklings with weird hairstyles. This is attributed to the Inklings' laid-back and inattentive lifestyle. It is revealed that Inklings do learn about Octarians and their army in schools, and Pearl did recognize the Sanitized Octarians as Octarians, which may imply that descriptions or depictions of Octolings are absent in Inkling school curriculum for Inklings not to notice. Octarians can be split into various sub-species or sub-classes, where most of these Octarians resemble severed tentacles, which carry two protruding, circular eyeballs with a green sclera and purple-blue small iris with purple markings around the eyeballs. They have large, round, connected, purple lips, but lack other visible features such as ears or noses. All of these tentacle-like Octarians have two small and stubby legs but otherwise lack humanoid limbs. The sub-species that differs most from these groups are the Octolings, which are the only types of Octarians that have all 8 limbs as octopuses have, whereas other Octarians are comprised of fewer limbs. The Octolings also have the most humanoid form of the Octarians and are able to switch between their humanoid form to an octopus form just like Inklings. The octopus form for the Octolings who are seen working for the army still have green sclera and small irises and pupils as opposed to the defected Octolings, which have white sclera and bigger iris and pupils. Both of Octolings have black markings around their eyes, with the exception of DJ Octavio, who still has purple eyelids in his octopus form. When splatted, they have a “ghost” which flies away. Currently only Octolings and the Octo Samurai have shown this ghost animation, as well as being the only ones shown respawning from a spawn point. The majority of Octarians have red tentacles and use various shades of purple/magenta for their ink color. Octolings have also red hair, while Elite Octolings also have black or dark red hair. The octopus form of Octolings, however, match the same color of their ink just like Inklings. It is also shown that at least Octolings are capable of changing ink color, based on the defected Octolings living in Inkopolis. Aside from the Octolings, the rest of the Octarians' gender remain unknown, with the exception of Octo Samurai who is referred to as male. In the end of the fan-made issue of the Splatoon manga series, a then unnamed Specs flies over a bunch of Octotroopers and Octoballs. They appear again in the Hero Mode issues, when Goggles and Rider are enlisted by Cap'n Cuttlefish to recapture the Great Zapfish. The Octo Expansion arc introduces the Sanitized Octarians as well as Agent 8 and other Octolings. According to the first artbook, Octarians aren't able to reproduce on their own and are thus created by cutting off a tentacle from a host. Their intelligence and rank is linked to how many limbs they possess, with high-class Octarians possessing more limbs than lower-class ones. However, it is not entirely clear whether this lack of sexual reproductive organs applies only to the lower-rank troops in the Octarian army or to the player and enemy Octolings as well. Based upon the fact that DJ Octavio is capable of creating sentient Octarians by severing his own tentacles, it is possible that other Octolings may possess the same ability. Some of these sentient tentacles, such as the Octo Samurai, have been shown to take on more definite humanoid form similar to that of the Octolings, but whether this is in fact the same or even the sole process by which the Octoling class itself originates is still debated among fans. Worth noting also is the presence of Sashimori’s DJ, a ten-year-old Octoling. He possesses all eight tentacles and resembles an analogous phase in an Inkling’s own growth cycle, implying that Octolings and Inklings may share similar reproductive cycles. It should be remembered though that the exact reproductive processes of the Inklings themselves has not been explicitly detailed by official sources. The bassist of the Chirpy Chips is an octopus, but has never been connected to Octarians and bears little resemblance to Octarians seen so far. Some characters use slurs to refer to enemy Octarians, such as Marie repeatedly calling them for "Octoslobs" in the Octo Canyon campaign, Cap'n Cuttlefish calling them for "Octojerks" in Octo Valley, and Pearl once calling Sanitized Octarians for "Octo-nerds" in Octo Expansion. Octarian society appears to have an affinity for disk jockies, as every confirmed Octarian musician is a DJ. Octotroopers shown in the trailer. An army of Octotroopers marching forward. Agent 3 shooting at a Shielded Octotrooper. Concept art of Octocopters, Octobombers, and what may be an Octoball seen from the back. Concept art of Octotroopers, with a Shielded Octotrooper's shield at the lower left. Concept art of two bosses, the Octostomp and the Octonozzle. Concept art of Octarian UFOs. Concept art of Octarian Kettles. Octotroopers in Turquoise October's album art, who may be Octarians themselves. Some Octarians in the Splatoon manga. The Sanitized Octarians from the Octo Expansion. This page has been accessed 208,902 times.